Tuka used to sing abhangs everyday and a lot of Sadhus and baghavathas would come to listen and participate in this. Whoever came for the kirtans went back with heart filled with love and affection towards Vitthobha. There was a person by name Rameshwara Bhatt in Dehu. He was well versed in the sastras and was preaching about Dharma sastras. No one came to his preaching’s but everyone went to Tukaram’s kirtans. Seeing this he was angry and said that Tuka was a Vysya and that he has not read the sastras and was blabbering something in the local language Marathi and was spoiling all residents in the city with his abhangs. Bhatt also said that he was a Brahman and had read all the sastras and knew more than what Tuka knew about the sastras. He then said that in his discourse he was saying what the rishis had written earlier, but Tuka was writing his own poems and singing that to the public. When Tukaram came to know what Rameshwara Bhatt was feeling about him, he felt that Bhatt may be correct as he is a very learned person. He never even got angry with him but went to him prostrated to him and asked him if he had done some mistakes in his abhangs. Bhatt then asked him who he was to advice others and asked him if he had studied the sastras and puranas and why he was saying something on his own. Bhatt then told him that Tuka was doing a great sin by doing all this and said that he was also making others commit sin by listening to it. Tuka then told Bhatt with tears that he dint know that he was committing a sin by doing all this and told him that he would do whatever Bhatt asks him to do as he was the most learned man in the city. Bhatt then asked him not to compose or sing any more abhangs and also asked him to throw all his compositions. Tuka then came back to his house took all his compositions tied it in a silk cloth and was thinking what mistake he had done in those compositions and his eyes were filled with tears. He then felt that Bhatt who was a scholar would not lie and that he should immediately destroy it. He then took the bundle to river Indrayani and again had a look at his compositions; he saw that he had written only about the beauty of Vitthal, Nama mahima, Guru mahima, Ekadasi mahima, Prahalada, Dhruva and other bhakthas. He then felt that Vitthal was living in every abhang composed by him and how he would throw him in the river Indrayani. He was sitting under a tree near the banks of Indrayani and looking at his compositions with tears. These were his only proud possessions. He then felt that having promised Bhatt that he would destroy it he threw his compositions that were tied in a cloth in to the river. The abhangs which were his only possession had now gone with the flood in the river. He now couldn’t sing any more abhangs as Bhatt had asked him not to sing and he knew nothing other than singing the praise of Pandurang. He was crying and sitting under the tree. His wife and children came in search of him and asked him to come back home. He would only say “Panduranga Panduranga” with his eyes full of tears. He felt like he has lost everything in his life as he now could not sing the praise of Vitthal. The next morning when the priest went to open Vitthobha’s temple in Dehu, he saw a bundle on Vitthal’s head. The priest rushed in to remove it and the bundle was wet. He opened it to see what was inside and it had all the songs that Tuka had thrown in to the river. They took the bag and came running to Tuka to show it to him. Tuka was chanting the name of Vitthal and still sitting in the bank of the river. They then gave it to him and Tuka asked why they had taken it from the river. The priest then told him that when they opened the temple for suprabatham, they found this in Vitthal’s head. Hearing this Tuka was happy and understood that Vitthal has recognized his poems and that there were no mistakes in it. Rameshwar Bhatt on hearing this leela of Vitthal, came running to Tuka, and asked him to forgive him and also praised him that he was a mahatma. Tuka then said that Bhatt was a Brahman and had also learnt the sastras and that he should not ask him to forgive him. Tuka also said that this was Panduranga’s leela to show to the world that he is happy with my abhangs and that there was no fault with Bhatt. 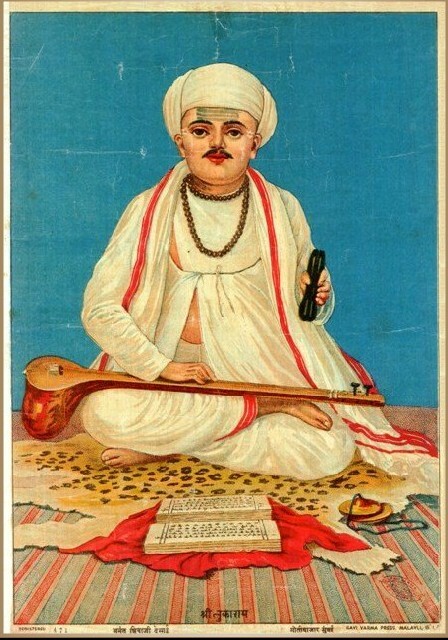 After this incident Tukaram’s abhangs became very famous and many people started singing his songs and his collection of abhangs came to be known a Vaishnava Veda.